At every writing workshop I teach, I learn something. Or relearn it. Recently with a group of twenty earnest adults in a small library room I was reminded of something I had forgotten: it take courage to write. Courage to put down the first sentence. Courage to keep going. Courage to share what you’ve written among friends. Then, with luck and publication, courage share it with the world. For memoir writers, there is an added terror: what if my mother (father, sister, brother, minister, high school teacher) reads what I’ve written? Especially after I’ve painted a less than flattering portrait of them! And what will they think of me, now that they see how my mind works? I have fears, worries, complicated and sometimes dark thoughts—but I’ve always kept those to myself. Yet now they’re on paper for everyone to see. Will they look at me differently from now on? To be honest, yeah, they probably will. The act of writing is a kind of coming out to the world, and that takes courage. As a professional writer, daily writing is a habit of being for me. A way of life. I’ve long gotten over much fear of writing (my fear now is of irrelevancy). I’ve forgotten that feeling, early in my career, that writing was like walking out to the end of the diving board. That it was either jump off–start writing–or walk backward and climb down, defeated forever. Do I have any advice for overcoming fear of writing? Fear of exposing one’s true self? Of revealing one’s inner, secret thoughts? Yes, I do. Because there are already so many factors (family, friends, work, time itself) aligned against the act of writing, let’s not add ourselves to that list. Let’s not ourselves be our biggest censor. If you have an idea that just won’t go away, that demands your attention, it is asking to be written. You owe it a chance at life in words. And no one’s going to put it in words if you don’t. “But what if my mother reads it some day?” (That fear again.) To that I’d reply: “What would be worse–her reading it? Or you censoring yourself?” And besides, it might well be that what you’ve written will clear the air. Bring closure to an issue. As well, your writing might far less important to some worrisome reader than you have imagined. In short, writing with courage is you becoming a fully actualized adult. It’s you presenting your truths to the world. For that, you need make no apologies. Hi Sheila! Thanks for the nice note. I have a few things coming up. Check out my Events page on the website. Hopefully one might synch with your travel plans. But if it doesn’t, and you’re here, ring me up anyway. Happy to reconnect. We’ve been connected a few times over many years, but not for a long time now. I’ve always really appreciated your writing and your speaking. I had so hoped to be able to participate in the workshop you referenced above, but it was full early. After a few years of academic and journalistic writing, a brief stint at garden/food blogging and then no writing at all for many years (unless you count regular letter-writing), I am finally, at almost 62, opening up to more creative and imaginative work. It’s something I’ve wanted to do since I was a little girl, but never felt it was my ‘strength’. Also, I am a perfectionist who has, until now, been unwilling to let anyone see my more creative work about which I am much less confident. Add to that the feeling of not being ‘credentialed’ (the right course work, workshops, degree (MFA), etc. and all those great writers I’ve studied and taught sitting on my shoulder holding forth. It’s a wonder I can write at all. This is all just to say this post is very welcome, very relevant to where I’m at right now. Time to take that leap. If not now, when? Thank you, Will. I will hope for a future workshop. Great to hear from you. Yes, perfectionism can be a hindrance–glad you’re self-aware about that. I struggle with it too. Happy to talk more some time. Shoot me an email via my (this) website. I was at your writer’s talk in Bagley. Thanks! It was helpful. Like you mentioned in this article, and again in Bagley, it does take courage to write. I set up a new blog and 48 hours ago I put my launch content online. My wife posted a picture with a link on Facebook. As of yesterday, I had 359 page views on the blog, and 9 comments. The blog is about overcoming depression without medications. My personal story is generating most of the traffic. These are things I’ve only shared with my wife, until now. 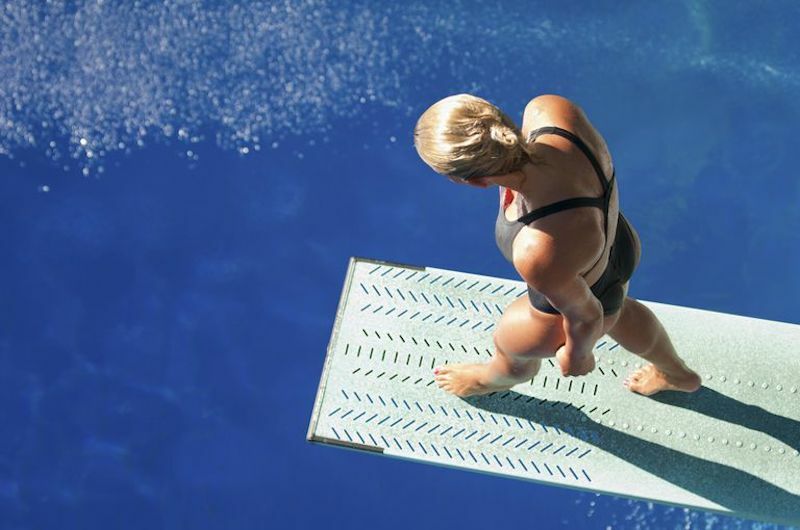 I’m not standing on the diving board—I’m in free fall! Thanks for covering this element of fear and disclosure in your talk. Hi Larry. I missed this earlier, sorry! Thanks for coming out to Bagley, and congrats on the launch. Sounds like you’re getting some good traffic. That means you’re connecting…. Good luck going forward.